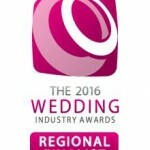 Congratulations to all the Peaks & Dales Weddings suppliers that have been short-listed for their regions in The 2016 Wedding Industry Awards. Bridal Retailer – Gracie Bleu, Matlock & Gracie Bleu, Buxton. Town or City Venue – Old Hall Hotel, Buxton. The North West awards will be hosted by Peaks & Dales members Heaton House Farm whose Events Team have also been short-listed. Good luck to them all and we hope to see you all at the national awards event in January.